After hundreds of years in union with Denmark and Sweden, Norway finally got its independence in 1905. Several changes within the Norwegian society were therefore a necessity, especially for the monarchy. Through a referendum it was decided that Norway should have its own royal family: Prince Carl of Denmark and Princess Maud of England and Ireland, later King Haakon VII and Queen Maud of Norway – the first Norwegian Queen since 1319. Queen Maud quickly became accustomed to the new country and took her royal duties very seriously. She supported numerous charities, particularly those who worked for children’s health and animal rights. She also got involved with music and art. In time, she also learned what every Norwegian, according to the myths, should know: Cross-country skiing. During King Haakon and Queen Maud’s coronation tour in 1906, a royal dessert was specially made for the King and Queen. It was named ‘Queen Maud Mousse’ or ‘Haugesunddessert’ by locals in the Haugesund area in Western-Norway. It became a very popular dessert throughout the country, and today it is common for Norwegians to serve it on the National Day, the 17th of May. 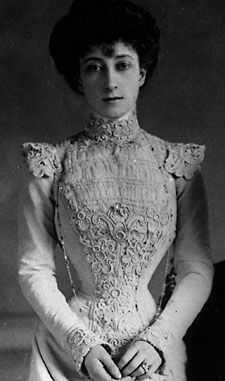 Maud lived up to the contemporary ideals of female beauty with extravagant outfits and her corsets. As an adult, she measured 18 inches (!) around the waist – which suggests that she probably did not eat too much of the dessert named after her. Whisk egg yolks and sugar until stiff and fluffy. Whisk in the port wine. Put the gelatin to soak a few minutes. Squeeze out the water and place in a saucepan with a tablespoon of whipped cream. Heat gently until it melts. Let it cool a bit and fold it into the egg mixture. Mix in the remaining cream. Grate the chocolate on a grater. Place the chocolate and the egg mixture in layers in a big bowl or in several small cups. Some also add a thin layer of strawberry jam. 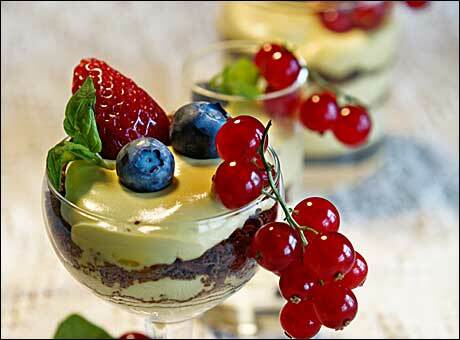 Finish with chocolate and garnish with fresh berries and mint leaves.